Meat allergies seem to be more of a problem than many people think, especially doctors. There is a meat allergy article on this website that gets quite a few visitors. Many tell a similar story of having a definite allergic reaction to various types of meat, especially pork, but beef too. Often their doctors tell them that there is no such thing as a meat allergy. This just isn’t true. A meat allergy is considerably less common than a pollen, mold, wheat, dust or gluten allergy, but it is common enough to get quite a bit of interest on this website. If you have a meat allergy, then it can be managed by avoiding the specific types of meat you are allergic to. Many people report being allergic to just one or two types of meat. 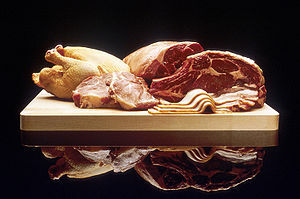 Occasionally people are initially allergic to one type of meat (for example pork) and later develop an intolerance to beef. There must be other people who are sick a lot (or occasionally, depending on their eating habits), who do not realize that they are allergic to meat. In this case, it is well worth cutting out meat for a while to see if you stop getting sick. See the list of meat for ideas on alternate types of meat. This may give you some new ideas about what to eat. YES!!! !…………I knew it!! I was in the hospital for surgery, they asked their usual questions. I told them about how Chicken and Pork gives me pustular bumps on my hands and feet. A female Doctor said a word as soon as I told them about my affliction. So they know, just don’t want to get sued like Oprah did. hi, ive been googling this topic alot because i wasnt even sure you could be allergic to meat. For me it started with eating beef. But ive noticed lately that chicken also makes me feel like sumthing is stuck in my throat for hours after ive eaten(its actually 5am now, i had chicken for supper last night at 8pm). weirdly enough beef sausages/minced meat/processed beef like corned beef etc doesnt make me feel like my throat is closing up. Drinking a glass of water used to make me feel better. Now it does nothing. I dont have a problem with mutton, pork (cant be too sure though because i havent eaten any in a while) or seafood. What is wrong with me? Have you had any tick bites? That can often be the cause. Or just because, like any allergy. I just learned about this reaction to red meat after you have been bitten by a tick. There is a blood test that can tell you if you have this sensitivity due to the tick bite. It is called an alpha-gal test . (for antibodies) I’m not sure of anything at this point because I have just heard about it. If you stay away from further tick bites it can go away in a few years. I went through hell at Air Force basic training this past winter; getting horribly sick to my stomach. I have had stomach problems my whole life, but it got much worse when I was there. I got honorably discharged because I got so sick. It was suggested I follow-up with an allergist at home. I tested positive for a beef allergy! makes sense, because I was eating beef as part of my lunch and dinner while there. I tried cutting out all meat for 3 weeks, because thinking back, I’ve had bad reactions to all red meat. I had goat 3 weeks later, and got the same terrible reaction. The allergist said there’s no test for other types of red meat, so he said it must be all of them. I eat chicken and pork just fine, luckily. I find that if I eat anything with even traces of beef (the worst of the meats that give me reactions), I get horribly sick. By the way, I had a milk allergy as a baby and throughout my childhood. The allergist said it might have stemmed from that. My husband gets the same thing! I’ve been looking into it after recently hearing about the tick thing which doesn’t appear to be his problem since he can eat pork but not red meat. Started when he was in his 20’s. But he also can’t eat sheep and goat dairy (which is less refined than cow dairy). He’s convinced it’s from something introduced into the food supply around that time as it developed slowly for him. Have you discovered anything more about your allergy? I deathly sick for 8 years and have continually added one thing at a time to the things I cannot eat. Beef, pork, chicken, fish, wheat products and all grains, eggs, cheese, milk products, and all purine protein vegetables. I live on steriods, epinephrine, my nebulizer, benadryl, alka seltzer plus and so on. I cannot find a doctor who can diagnose and treat me. I have figured out a lot myself and have a doctor who treats the symtoms. Everyone says I can’t be allergic to meat and all this other stuff. The one thing I notice is if I don’t eat more than 2 grams of protein I am much better. You may say just stay away from all of this… I try but then I get sick and I am not sure what is causing it. I need a very smart doctor who can test me and find out what protein or whatever that I am allergic to. Then I can look for it and stay away from it. I have many things wrong with me because of this… too many to go into. I am in a wheel chair half of the time because of the pain and swelling and have rash and blisters all over me especially my feet and itch… oh my gosh… can’t even explain how horrible it is!! This all happens when I eat protein. I have been to about 75 doctors some of the best… no one knows what is wrong and no one believes I can be allergic to meat protein. Where can I find a doctor who can help me does anyone know??? When I was 6 I had a severe anaphylactic reaction to a cheeseburger… Ironically I was alergic to both. Being almost 20 now. I still have no idea what it is causing it… Prick tests show I’m still alergic to pork and beef. Blood tests show I’m no longer alergic to pork… I’ve never had it, so I wouldn’t know. I’m still severely allergic to beef, and only certain types of cheeses… Doctors suggest its the aging of the cheese.. But that’s off subject.. Anyone have a clue? Maybe point me in the right direction… Any help would be much appriciated. (also I’ve always been able to eat chicken and turkey, I grew out of every sea food alergy I had when I was about 12). whenever i eat meat or smell meat i feel like i wanna throw up.does this mean im allergic to meat? Not necessarily, there could be lots of reasons for that, including physiological. The question is more this: if you ate something with meat and didn’t know it, would you feel like you want to throw up? Anyhow, it sounds like if meat makes you feel like that you will avoid it, allergic or no! I too have an allergy to meat and fish, all kinds .It just developed all of a sudden THE WEEK BEFORE I was eating tuna no problem, then the next week I had to go to the ER almost died this happened with both meat and fish. my GI doctor looked at me like I was crazy and said no your not and wants to see the allergy tests from the Mayo clinic the tests all saying I’m allergic to all meat and fish. Thanks for writing this. My 6 year old is allergic to beef and pork along with dairy, egg, and nuts. The meat allergy being fairly rare worries me because of the lack of labeling on packages and such. Wow, I’m so happy I’m not alone. My experiences with red meat over the last couple of years have not been that great, every time I would go to the doctor they told me it was just a stomach virus and to just let it run it’s course. My parents eventually got frustrated with my constant bouts of this “virus” and thought I was making it up to skip school. I noticed everytime I consumed pork or beef products this so called “virus” would come back. After a while, and many bottles of Pepto, I got tired of it and just completly cut pork and beef out of my diet. This seemed to control what the doctors told me was a case of the stomach virus. This article has absolutly made my day. I’m happy to know that I’m not the only one that suffers from this strange allergy. The next time I go to see my allergy doctor I will definatly tell them about this allergy. When the reactions started I was only 15 and now I’m 18, and I’m so happy to have a diagnosis. I hope sometime in the near future doctors will be able to find a cure for this wretched allergy. I’m glad this helped. It is so much easier when you are positive about the cause and know that others have a similar problem (and are able to deal with it)! My almost 9 year old grandson was just diagnosed as being allergic to beef, pork, chicken and turkey. But in addition to that, he’s also allergic to shellfish, eggs, wheat, oats, rice, beans, nuts, corn, peas, onion, garlic and soy. I am trying to help my daughter figure out what this child can eat! They already eat a very healthy diet but this is ridiculous. Most of his allergies manifest themselves as an esophageal erosion, however, eggs, nuts and soy will cause swelling of his throat and eyes. He is the middle child of 5 and he also has cerebral palsy and autism and is high functioning physically…not as high functioning mentally. Repetitive eating is one of the manifestations of his autism so changing his diet from the things he loves is going to be a challenge. What an incredible challenge. I’d appreciate any ideas on how to feed this child. Thanks! I suggest you see a nutritionist. This sounds like a very complicated case and it is important that he gets a properly balanced diet despite the many restrictions. You may also get ideas from the following post, although I can’t guarantee you will find anything that is not on the list of exclusions. Still the list of foods in this post is growing. See Gluten Free Foods. Hope that helps. Other visitors may also have ideas for you. I just noticed that when I eat red meat or chicken maybe 10 minutes after eating meat my body needs to get what I eat out of me. I am allergic to cats and I don’t get the same reaction. But I can’t tolerate eating meat. Does this mean I am also allergic to meat products? First of all, different allergens often cause different symptoms in the same body. It sounds like you might be allergic to meat products. In any case, if they make you feel bad, avoid them. Call it an allergy or not, but avoid them if that makes you feel better. I have a question can someone be allergic to DOMESTICATED animal meat but still eat WILD meat of the same species? i am celiac but i have figured out that i am allergic to red meats,chicken,fish and most of the time eggs….. my question to anyone out there is does anyone ever develop large amounts of phlegm with the onset of an episode of their throat closing.. that is my first sign that i am in trouble… i have had this since being diagnosed with celiac…. i can eat hamburger, not in paddy form but fried very well done…. that is it….. i was in the emergency room last night and the end result is that i needed to be put on an antidepressant and no one was allergic to meat…. long story i would just like to know……. i have had used benadryl strips when i start closing up and 90 percent of the time they work….would like to know about the phlegm thing. Yes. At times this is my first sign of anaphylaxis. I take three dye free benedryl, and pepsid. My allergist also prescribed steroid pills and epinephrine to be added to the mix immediately upon allergic reaction. I also have other diagnosed food allergies either from skin or blood testing. can someone be allergic to both red and white meat? I don’t see any reason why not. People with allergies are likely to have more than one, unfortunately. Yes you can be allergic to both.If you are allergic to both it is more likely the meat protien that you are allergic to and not the meat carbs…..If this is the case for you as it is for me you will be highly allergic to one and possibly not so bad with other….for instance…Beef and any red meat is a fatal allergy for me and until recently poultry was milder BUT is getting progressively worse with age. but even to pork a white meat I also react.